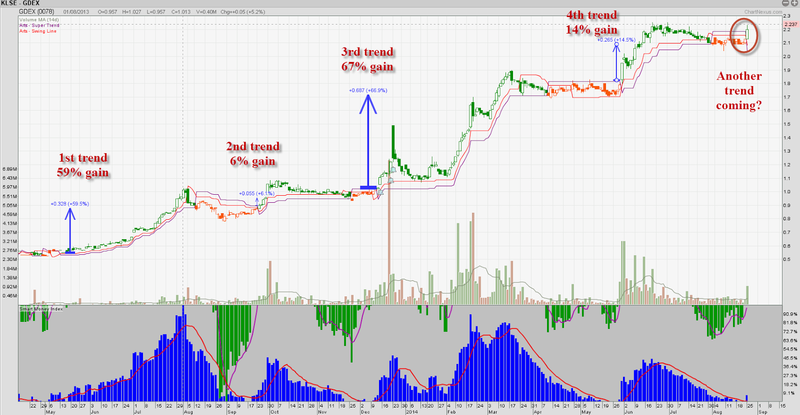 Yesterday we spotted this great trending Malaysia stock using our stock screener, after some study on this stock, i realise that this stock also have good story to support the trend, this company GDex is also owned by Singpost. From the chart, we see that whenever the green bars appear, there is very high probability that the trade can be profitable. Since 2013, the system has help to capture more than 140% gain in this counter, average win is around 36% over the past 4 occurrence, will this time be the start of another trend? GD Express Carrier Bhd (GDEX), which counts Singapore Post Ltd (SingPost) as a major shareholder, will gear up its operations as well as technology enhancement to cater to a bigger business volume, after Chinese internet giant Alibaba Group Holding Ltd bought a 10.35% stake in SingPost. A leading express delivery and logistics service provider, GDEX is expected to benefit indirectly from the SingPost-Alibaba tie-up. GDEX managing director and group CEO Teong Teck Lean, above, expects the company to see more volume from SingPost, as it has started strengthening deliveries for monobrands. He tells FocusM GDEX may have to scale up operations to anticipate big volumes and, in terms of technology, the company will have to enhance the integration of processes to be compatible with business partners including Alibaba and SingPost. SingPost is the first overseas postal agency in which Alibaba has invested. The Chinese company will become SingPost’s second-largest shareholder after Singapore Telecommunications Ltd, a 52%-owned subsidiary of the state investment arm, Temasek Holdings Pte Ltd. The two companies also signed a memorandum of understanding (MoU), which will allow them to discuss and negotiate a joint venture in respect of the business of international e-commerce logistics. This strategic business cooperation will tap into other e-commerce opportunities in Southeast Asia and beyond, by providing greater access to SingPost’s international logistics capabilities, infrastructure and delivery networks, as well as end-to-end solutions to Alibaba customers and merchants.